We've seen a lot of end-of-the-world scenarios, but this may be the first featuring giant praying mantises. These harbingers of doom were unwittingly unleashed by some teenaged boys in Iowa. The star of our story is Austin Szerba, who is confusingly in love with both his girlfriend Shann and his best friend Robby. Austin loves history and includes in his narration the history of his Polish family, as well as many other connections between the people in his small and previously-boring town. It's hard to describe this book in a way that does it any sort of justice, and I don't think I would have read it based on the description. It's hot right now - I keep hearing about it everywhere, and thought it just sounded too weird not to read. It is. The story about the unwelcome invasion is best uncovered bit by bit, so I won't go into that too much here except to say that there's a well-crafted explanation and it's a fun story. What makes it so is the way that Austin narrates, especially how he pulls together little bits of different stories and makes connections between them, all from an omniscient viewpoint. There are parts where we learn what is simultaneously happening to different characters all over town, and it makes the story both more immediate and more like something that's happening to the whole town, not just to our teenaged protagonist. I loved the theme about Austin's sexual confusion, and how devoted he remained to both Shann and Robby. The three were very close friends, and all were aware that Robby was gay (though he was only out to his two friends), and their friendship only became complicated when Austin started to realize his attraction to Robby and couldn't reconcile it with his continued feelings for Shann. Also complicating these feelings was the fact that he was constantly horny, which he mentions frequently. I found Austin's voice honest and sweet and funny, and these relatable characters made a good anchor for an otherwise very surreal story. There are about a hundred other things I want to tell you about this book: Austin's dog Ingrid, the boys' sad trip to a local gay bar called the Tally-Ho! and the controversy over the book The Chocolate War are just a few. But much of the fun of this book is discovering all this for yourself, and I encourage you to do so. This is my first Andrew Smith, and certain aspects of his writing remind me of another favorite author, A.S. King. They each have a very individual style, but the combination of realistic characters, humor, and a bit of the surreal would make me recommend either of these authors to fans of the other. Grasshopper Jungle is one of the most unusual stories I've read in a while, and one of those rare books that garners praise both from respected book reviews and all the teen librarians in my Facebook feed, all of which is well deserved. I read somewhere that Smith wrote this novel entirely for himself and only considered publication after he finished, which just goes to show you what can come of unleashed creativity, unfettered by concerns of the publishers. 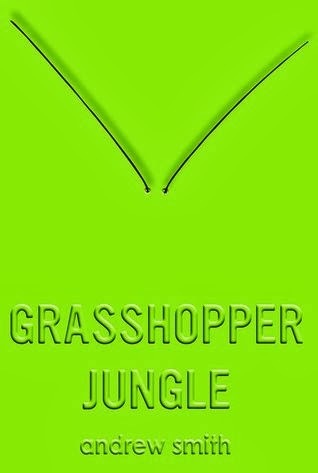 Have you read Grasshopper Jungle yet? What should be my next Andrew Smith book? (I'm leaning towards Winger.) Let me know what you think in the comments!